The World Seniors Championship will return to the snooker calendar in 2017. To be staged by Jason Francis of Snooker Legends, in partnership with seven-times world champion Stephen Hendry, the tournament will carry a top prize of £10,000, together with a place at this season’s Betfred World Championship qualifiers at Ponds Forge in April. 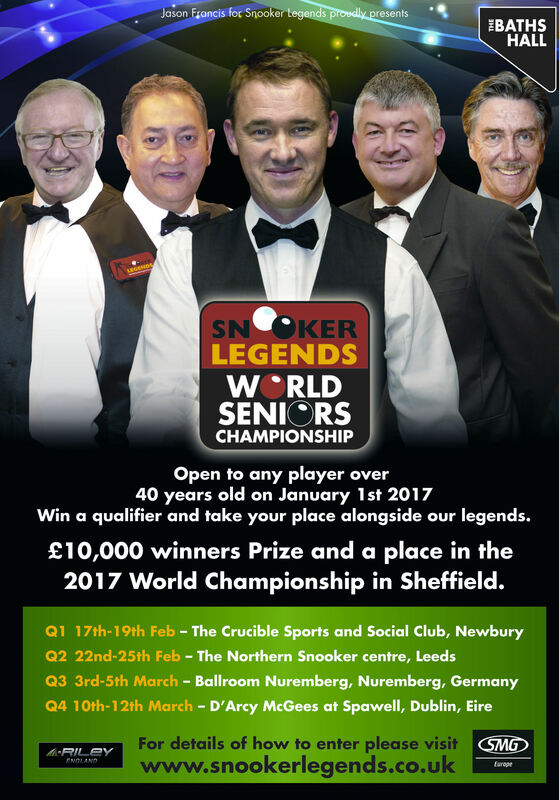 Open to all players aged 40 or over at the start of 2017, regardless of whether they have previously been on the main tour or not, the tournament will begin with four qualifying events to be held across February and March, with four successful qualifiers progressing to the main competition at the Scunthorpe Baths Hall on 21-25 March 2017. There the qualifiers will join eight seeded players, selected on the basis of a qualifying criteria which ranks eligible players based upon the number of world titles, triple crown events, ranking events and other professional tournaments won during their career. Leading the field is seven-times world champion Stephen Hendry, the Scot set to pick up his cue in competition for the first time since the 2013 World Seniors Championship. He will be joined by fellow Crucible kings Cliff Thorburn, John Parrott, Dennis Taylor and Joe Johnson, as well as Patsy Fagan, Tony Knowles and Willie Thorne who round out the top eight. At the main competition, 1,000 tickets will be reserved for use in the community to bring in school children, disabled groups and care homes from the local area to enjoy the snooker.